Workers will get more help developing skills relevant to up-and-coming jobs with the launch of a new department by the labour movement next year. The Future Jobs, Skills and Training unit will gather data on specific companies and industries where new investments and jobs will be over a three-year timeframe. It will work with unions, professional bodies, government agencies, consultancies and educational institutes to identify opportunities, National Trades Union Congress (NTUC) assistant secretary-general Patrick Tay said yesterday. For example, if there are 15,000 jobs coming up in infocomm and technology, the unit would find out if they are in Singtel or in other companies, he said at a media briefing on the initiative. Its findings will be shared with training providers and institutes of higher learning, which can use them to develop more relevant skills and training courses for Singaporeans. The NTUC Education and Training Fund, which had a $200 million boost announced this year, can be used to support training programmes if national funding is not available, added Mr Tay, who will head the new department. "We have lots of jobs but how we can minimise the mismatch of people to jobs will be a challenge for a long time to come," he said. The unit will run pilot projects by 2019 in five sectors, said Mr Tay, who also heads the Government Parliamentary Committee for Manpower. These are: financial services, infocomm technology and media, precision engineering, healthcare, and early childhood and private education. He added that ongoing work in this area is mainly done in matching people who are currently unemployed with the currently available jobs, but the new department will be more forward-looking. Explaining the choice of a three-year timeframe, Mr Tay said: "If you ask any consultancy companies or any forecasting experts, with this current climate and current disruption speed, we are quite unable to predict anything that is beyond three years. Within this three-year timeframe, we should be able to suss out where the openings are through a variety of nodes." The new unit was also highlighted by Prime Minister Lee Hsien Loong in a dialogue last night with labour movement leaders, which was held because unionists were worried about the spate of bad news on the economy and job losses, said NTUC president Mary Liew. 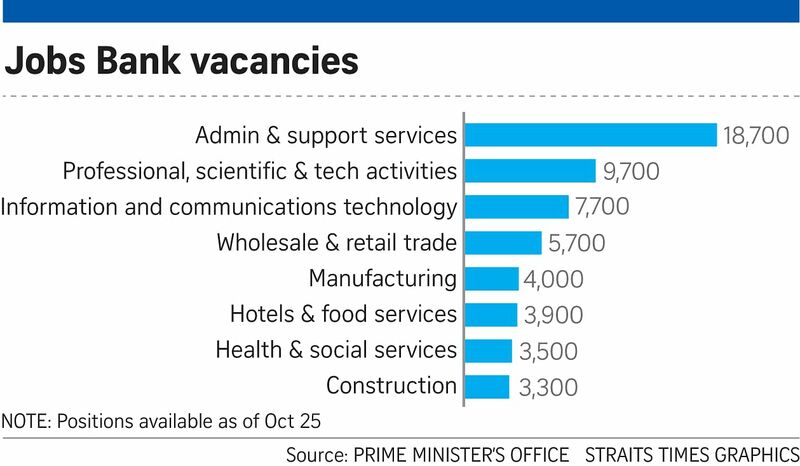 PM Lee asked some 300 representatives who attended to strive to represent more workers and encourage them to improve themselves through SkillsFuture, adding that funding for some training programmes will increase. By rallying workers to accept and adapt to change, the labour movement plays a very active role in restructuring, PM Lee said. "We have a comprehensive strategy in place, and we will be systematically implementing it to help all sectors of the economy, helping businesses and workers," he added. PM Lee also said the exchange of civil servants and people from the labour movement, which NTUC secretary-general Chan Chun Sing proposed, will help both sides better understand each other and the Government to make policies which respond to the needs of the workers. Mr Chan said in a Facebook post that amid current challenges, "there are bright sparks with pockets of growth and jobs available". Some workers have been displaced, he noted, adding: "Many have shown resilience by picking up new skills and adapting to new jobs in new sectors/industries. This is what I call 'placing today's unemployed into tomorrow's jobs'."